Is This The Worst Microsoft License Ever? 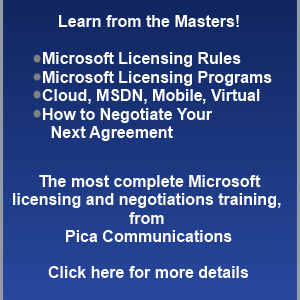 Is This the Worst Software License Microsoft Has Ever Dreamed Up? Many of our customers are getting pitches from Microsoft to switch to purchasing Windows per User subscriptions. As one customer who happily signed up for this told me, "we don't worry about Windows licensing and counting all the devices. We just license all our users and they can use any PC they want." Oh, boy. Spit out that Kool-Aid. The Windows per User subscription is my nominee for the worst licensing idea Microsoft has every come up with. Why? Licensing users is not its goal. Licensing devices is, and the Windows User subscription is an order of magnitude more complex than conventional Windows device licensing. Your biggest risk? In a hostile audit, a customer has zero chance to be compliant. Contrary to my customer's belief, users licensed this way absolutely cannot use any PC they want, without restriction. At a minimum, users who are licensed this way MUST use a specific PC most of the time. Whoa, you say. How can it be that when we purchase a Windows per User subscription we don't have the flexibility to use any and every PC? The answer is in the fine print. The Licensed User must be the Primary User of at least one device licensed for Windows 10 Pro or Enterprise, Windows 8.1 Pro or Enterprise. or Windows 7 Professional or Enterprise. This one device must also be the Primary User’s primary work device. What does it mean to be the Primary User?" The Definitions section of the Product Terms defines a Primary User as "the user who uses a Licensed Device more than 50% of the time in any 90 day period." Just to be clear on this, let's say you are the Primary User of a specific PC. If you have been assigned a Windows per User subscription and you spend 100 hours over a 90 day period with multiple computing devices, you must use that PC for at least 50:01 of those hours. Here's how that rule affects every organization that purchases Windows per User subscriptions. First, every user must have a specific PC assigned to them. At a minimum, the organization must have as many PCs as it has users. Furthermore, in an audit you need to be able to say which specific PC is assigned to which specific user. Most organizations will need more PCs than the minimum, especially if they have shared PCs such as a PC in a hospital exam room or in a 24x7 call center. A shared PC may have no single person who uses it at least 50% of the time, so no one can claim to be its Primary user. As a result, every user of that shared PC who is assigned a Windows user subscription must be assigned another PC on which they are the Primary User. Second, that PC must account for more than 50% of all the user's PC time, in order to qualify as the "Primary User's Primary Work Device." Microsoft does not define a "primary work device," but in the absence of a definition we should assume that it applies the same threshold as the language for a Primary User, "more than 50% of the time in any 90 day period." make sure they spend at least half their time on the PC for which they are the Primary user. For example, I might have a desktop in a cubicle, a PC that monitors traffic to my corporate Web site, a portable I use on the road, and a company-supplied PC I use at home. Altogether, I spend four hours a day in front of one or another of those PCs. That works out to about 260 hours of PC time every 90 days. Of that 260 hours, I must spend at least 130 of them on one of my PCs. Or take this situation, which I consider absurd--it is certainly impractical and costly--but hey, Microsoft made the rules. You work as a nurse on a floor with eight exam rooms and during the day you'll use four to eight of the PCs on that floor, plus a shared PC at the nursing station. None of them account for 50% of your computing time. To meet your Primary-User-with-a-Primary-PC requirement, you have to spend another three or four hours on another PC, assigned specifically to you, so that your time on that PC creeps over the 50% mark of all your computing time. I'm guessing that no organization that has signed up for Windows Licensing per user actually does such complex auditing, assuming they even have the tools to do it, so probably none are compliant. Among other things, to be compliant they will need someone to monitor every users' PC use so they could email them every 90 days, if necessary, and say "Joan, you haven't spent enough time on the PC in your cubical over the last 90 days, so we have to stop you from using any other PC and get another 20 hours of work on that PC." This isn't a "User" subscription. It is a fiendishly complex form of device licensing, tying users to specific PCs far more than if the customer had used conventional Windows device licensing. The only real benefit offered by licensing the Windows desktop OS by user is the right to access virtual desktops from any device. If, for example, you're using an iPad to access a virtual desktop, having a Windows User subscription covers that. As long as a user meets the other requirements of this subscription it may be genuinely useful. However, don't count time with virtual machines toward your Primary User requirements. Remember that a Primary user is "the user who uses a Licensed Device more than 50% of the time in any 90 day period." Microsoft's Product Terms define a Licensed Device as a "single physical hardware system to which a License is assigned." A virtual machine is not a physical hardware system and does not qualify. In my experience, use of virtual desktops is usually confined to a small number of users, such as a mobile sales team. This subscription has some utility there, but as a way to license every user in an organization it will be serious overkill for most organizations. Stick with conventional Windows licenses, adding Software Assurance, if necessary, to those. It is cheaper and far easier to manage. Why does Microsoft hang the dead weight of device licensing around the neck of Windows per user subscriptions? If you have been paying attention to Microsoft's financials, you will have noticed dramatic drops in its revenue from Windows on PCs. Companies and consumers aren't buying as many PCs or replacing them as quickly as they have in the past. PC sales have dropped by more than 25% since 2011. If licensing users for Windows were to cut customers free from the PC, the drop would accelerate. So the solution is to come up with rules that require customers to purchase more physical devices than ever. Let's see, what should we call them? Oh, User subscriptions, of course. A no-brainer. Literally. In spite of the outlandish rules governing Windows User subscriptions, rules that I can safely say no customer of mine that purchased these subscriptions was even aware of, most customers can probably relax a bit about enforcement of these subscriptions. Microsoft wants customers to purchase Windows user subscriptions, and they are built into the suites like the Secure Productive Enterprise E3 and E5 suites that Microsoft now pushes on every customer these days. Assuming that Microsoft account teams are even aware of the fine print, which I doubt (they're trained only to sell; never assume your account team knows anything about licensing), they're unlikely to check up on Windows User subscription compliance. Once made aware of the bizarre rules, most customers would back away quickly and that hurts the account team's ability to meet their sales quota. However, let's say that Microsoft doesn't like your company for some reason. For example, you're resisting moving to the cloud because you're not ready, you don't have a business case, or you're wary about turning your entire collaboration infrastructure over to Microsoft. Because it is impossible for a customer to be fully compliant with Windows per User subscriptions, this will become a prime audit target. I expect 100% of customers audited for compliance with these subscriptions will be penalized. Most customers will probably be offered a plea bargain. For example, if they will just change their mind and upgrade to the Secure Productive Enterprise E5 suite for every user, Microsoft will ignore the fiddly details about the Windows User subscription. That's a polite form of extortion, and for the many software vendors who have stepped up audits activity these days, it's just another day at the office. Let's say that you still like the Windows per User subscription or that Microsoft is promising you a great deal on it. I would strong advise against purchasing this subscription without a custom amendment that removed the Primary User/Primary Work Device requirements. "Notwithstanding any language in Product Terms, customer's Enterprise Agreement, or any other Microsoft document, Windows per User subscriptions do not require customer's employees or on-site contractors to be Primary Users of any device or to use any device as their Primary Work Device. This amendment survives termination of the current and any future contract with Microsoft." What that amendment, a customer is free to move away from PCs (toward broader virtualization, for example) and can ignore the impossible compliance rules for Windows per User subscriptions.